There is a legend of a great, magical bear that roamed the forests. No bear was its equal and all people lived in awe and fear of its massive presence. However, there came the day that four talented brothers and their small dog tracked the magical bear and chased it for days through the woods and plains until at last they all fell over the edge of the earth and into the stars. When the seasons change and autumn comes you can see this story in the stars as the head of the great bear is the square shape some call the bowl of the Big Dipper and the hunters and their dog are close behind in the Dipper’s handle. The Tlingit called them half human, half god and other tribes called them “grandfather” or “cousin”. Their scientific term is ursine and we know them as bears, the most powerful carnivores in all the world, and in Alaska there is a good chance that you will run into one of them. The black bear is the smallest of the Alaskan bears, though small is relative in the bear family as this animal on average weighs 350 lbs, and though their name has the world “black” in it, they can also be brown, gray and cream. A black bear can be distinguished from others as they lack a large shoulder hump and their profile is that of a straight head and snout. Their rump is higher than their shoulders and the ears are longer and come to more of a point. The claws are black and short giving them a great ability to climb trees. All bears are omnivores and opportunistic, meaning they will eat anything that is available to them such as insects, berries, fish, deer, moose and caribou. The yearly cycle of all bears is the same. They emerge in the spring from their dens hungry and ready to eat the first green plants that are springing up from the winter months. In summer they are feasting on fresh berries and the salmon runs, putting on as much weight as possible. By fall there is a mad dash to eat the dwindling food supply. Those that don’t gain enough weight by this point risk starvation or being killed by other bears. As soon as the snow begins to fall most bears are hibernating and mothers give birth to cubs inside the den. The Kodiak is the granddaddy of brown bears. Standing over 10’ tall on their hind legs and weighing up to 1600 pounds from a steady diet of grass, plants, and berries, they are the largest terrestrial carnivores on earth. About 3500 of them can be found on the pristine Kodiak Archipelago, making it one of the most dense and popular bear-viewing sites in Alaska. The Alaskan brown bear or Alaskan coastal bear comes in second to the Kodiak and can be found up and down the southern coast. While not as large as the Kodiak kings they still average 800-1200 pounds. Their diet is rich in salmon and they use many different tactics to catch the fish, including waiting at the bottom of the falls for the fish to jump, standing at the top of the falls and catching the fish in their mouth as the salmon leap out of the water and even pinning the slippery fish to the rocks with their massive paws. All grizzly bears are brown bears but not all brown bears are grizzlies. Grizzlies are smaller than the Kodiaks and coastal bears and can be found roaming the interior of Alaska and Canada, and down into Montana and Glacier National Park and Yellowstone Park. Deep in the frozen tundra of Alaska and Canada, where the spirit of the northern lights touches the ice, roams a bear the Inuit people call ‘Nanook”. He is the undisputed ruler of his wintery kingdom, where he fears no one. Revered, prized and honored, the polar bear stands alone at the top of the food chain. As large as a Kodiak bear, a male can weigh over 1500 pounds. They spend the vast majority of their lives on the sea ice where they exist to hunt seals by patiently waiting for one to come out of the water where they crush its skull with their massive jaws. While seals are the preferred meal they have also been known to hunt caribou and beluga whales. Their girth masks the fact that they are agile swimmers and divers. The white coat is made up of water repellant hair on top of a thick undercoat that channels the sunlight to their black skin. There are areas that are best for viewing polar bears but it is highly recommended that it is done with a guide. These bears have absolutely no fear of humans. They are dangerous predators and do view us as prey. While polar bears spend most of their time on the ice, during ice-free periods between August and October they will make their way to land near the village of Kaktovik, which sits on the edge of the 20-million-acre Arctic National Wildlife Reserve. It is a small Inupiat village that has very limited hotel rooms and other amenities. The most northern town in America, Utqiagvik is 300 miles north of the Arctic Circle. The sun sets on the town in early November and doesn’t rise again until the end of January. In between there is just one hour of twilight. Most visitors arrive in the summer with twice daily flights from Fairbanks. There are several hotels and restaurants and plenty of opportunities to see a wide variety of bird life including the snowy owl, enormous herds of caribou, the arctic fox and of course polar bears. Called the polar bear capitol of the world it is also a whale viewing hotspot, a birder’s paradise and it has been said the northern lights will take your breath away. But by far it is the polar bears that attract the most attention. Thousands of visitors descend on Churchill every year to view and photograph these magnificent creatures in the wild. Prime viewing time is in October and November when the bears are on the move from the summer habitat back to the seal hunting grounds. There are local tundra vehicles that make it possible to view the bears in a safe manner. These unique vehicles sit up very high and are designed to carry passengers smoothly over snow and ice, protecting the occupants from hungry bears. There is also a wilderness lodge built on the bears’ migration route and guided bear walks. Iqaluit is the capital city of the Canadian territory of Nunavut, which means “the place of many fish.” It is known for its vast tundra and soaring ice-capped mountains. It is home to many Inuit artists, filmmakers and musicians. People of this area love to venture out on the sea and ice at all times during the year for many types of outdoor activities, including dog sledding, skiing, snowmobiling, boating, rafting and fishing. Beluga, bowhead and narwhal whales call this area home, as well as caribou, muskox, seals and polar bears. There are numerous hotels, lodges and bed & breakfast accommodations. The Arctic Kingdom is a tour company that has specialized in polar bear viewing for over 20 years. With their operators you will be able to view polar bears in their natural setting every season of the year. In March and April you will have the chance to spot bears on the ground as they roam the sea ice. In May and June polar bears can be viewed at the floe edge, and in the summer guests can view them from one of their boats as the bears swim in the Arctic waters. During the winter months there are many opportunities to see them on the snowy tundra as they make their annual migration. When deciding to view polar bears in their natural settings, it is best to choose an experienced guide. As fluffy and cute as polar bears seem to be, they are fierce and dangerous and should be treated with respect from a safe distance. A hungry bear is a dangerous bear and the protocols that work with other bears don’t necessarily work with polar bears as they have no fear of humans. That is what makes them the lord of the Arctic. While popular conception has bears around every tree trunk in Alaska, they can still remain elusive. However, there are some favorite sites to view these creatures in order to take that framable quality photograph or just to spin a few bear-raising tales for the friends back home. Katmai encompasses over 4 million acres and is located on a peninsula in southern Alaska across from Kodiak Island. There are several active volcanoes in the area with the last major eruption occurring in 1912 with Mount Katmai and Novarupta erupting simultaneously, causing a pyroclastic flow that covered a nearby valley with ash. As the volcanic deposits cooled they produced steam from fissures earning the name “Valley of 10,000 Smokes”. Katmai gives the visitor a unique opportunity to explore immense, untouched wilderness and volcanoes, as well as opportunities for backpacking and camping. It is Alaska at its finest. It is also here in Katmai where you can experience up-close and personal Alaska’s famous and massive brown bears. While the park is open year round it is remote and cannot be accessed by car. There are over 2,200 bears in Katmai and there is no better place to watch these amazing animals fish, sun and congregate than at Brooks Falls. During the height of the salmon run in July up to 70 bears can be seen from the wooden platforms, each one wading into the water with its own unique fishing technique. Seeing these bears in the unspoiled beauty of the forest instinctively foraging for fish creates unparalleled photography opportunities that will surely dazzle family back home. Most visitors to Katmai come to this area via float plane, arriving on Naknek Lake as Brooks Lodge is one of the only developed areas in the park. There is a 60-person capacity campsite as well as cabins, cooking shelters with a fire ring in each shelter, food and gear storage cache and an electrified fence surrounding the area. One of the most enjoyable ways to explore this area is through a guided tour with operators having both day and overnight trips available. A guided tour can add much depth to your Katmai travels and often includes sites and experiences you would not be able to have on your own, as well as the added safety of being with skilled guides in bear country. The only bears to regularly inhabit Katmai National Park and Preserve are brown bears. Bear watching at Brooks River is unique, because it is a large gathering location for brown bears. Even if you only spend one hour watching bears at Brooks River, it is easy to see how each bear is different. These bears are not only distinguished by physical characteristics, but more importantly, they are also distinguished by their habits and behavior. Bear watching at Brooks River will give you a chance to see these brown bears in their own habitat. A meadow filled with wildflowers bursting with color, a glacier-filled creek meanders through the meadow while a snow-capped mountain protects the idyllic scene ... welcome to Hallo Bay! The Bay is a sanctuary within a sanctuary located on the sea in Katmai, and is home to bears who graze on vegetation and clams in early June and stay around to fish during July and August. Hallo Bay is difficult to get to and is best explored by using one of Alaska’s authorized guiding tours. High in the Aleutian Range, glacier water makes its way down toward Cook Inlet in southwestern Alaska. This 200 square mile protected area provides home and refuge to an abundance of wildlife, including red fox, moose, caribou, wolves, birds and fowl and of course brown bears, who can best be seen in early July through mid-August feasting on the chum or dog salmon. This area is controlled by an access permit program from the Alaskan Department of Fish and Game. This ensures that visitors can enjoy a pristine piece of wilderness and the wildlife is safe and protected for all generations. Standing as a sentinel, keeping a watchful eye over Alaska’s forests and coasts is North America’s tallest peak-Denali, but the park is far more than a tall mountain. With over 6 million square miles of wilderness to explore and one road that bisects it all through low elevation taiga forest, alpine tundra and mountain tops frosted in icy snow. Something for everyone awaits the adventurous spirit in Denali and where better to spend time with the 169 species of birds, 39 mammal species and 14 varieties of fish. One of the best ways to view the wildlife is while riding a bus on the Denali Park Road. Relax and watch the stunning scenery pass by while an expert navigator follows the winding Park Road. Located on the west side of Cook Inlet across from the Kenai Peninsula, this creek is the place to watch both black and brown bears fish for sockeye salmon and teach their young cubs the art of catching their meals. Lake Clark is a very rugged, unspoiled area of natural beauty. Sleeping volcanoes, formidable ice fields and glaciers, lakes teaming with trout and salmon and a variety of wildlife attract true outdoor enthusiasts. The area of Crescent Lake attracts a large number of brown bears to the area including mothers and cubs, young adults and big boars. 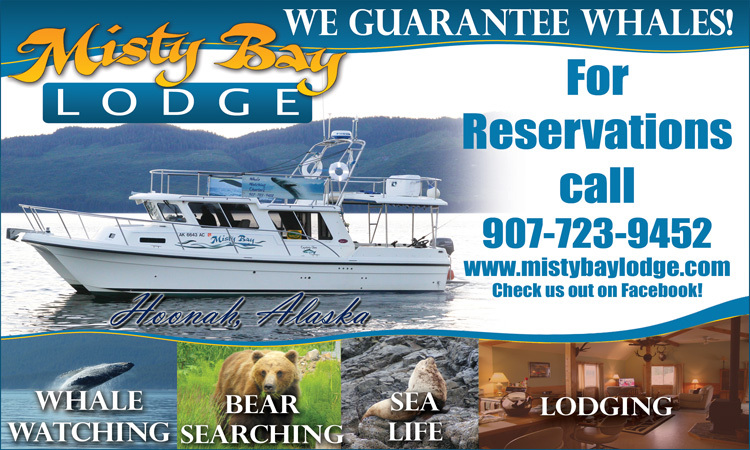 Located 70 miles from the city of Kodiak, this is the Island’s premier bear viewing spot. The sockeye salmon can get backed up at the entrance to the fish ladder (designed to help the salmon navigate Frazer Falls) and the renowned Kodiak bears sit back and feast on a salmon buffet. The Karluk basin is the ancestral home of the native Alutiq people and is also the home of the Kodiak bear, the king of all carnivore land animals. It is here where these bears graze and fish undisturbed by modern life. Step back in time as you watch the bears living the same way they have for thousands of years. Near Wrangell, an ancient Tlingit native fishing site known as Anan Creek has the largest pink salmon run in Southeast Alaska. The observatory is only accessible by boat or plane and the observation platform overlooks the cascading falls where salmon jump up the river almost into the bear’s mouth. A half mile trail leads to the observation area and bears are often seen on the trail as well as other wildlife. This area is limited to 65 people per day and is managed by the U.S. Forest Service. It is recommended that you reserve your pass at least six months in advance. Forty miles east of Ketchikan in the Tongas National Forest is a national monument and wilderness area. Small glaciers dot the area and canals criss-cross the valleys beckoning to be explored by kayak. This area is very remote so most visitors arrive by cruise ship or charter plane. Bears use the site from mid-July through early September, following the arrival of salmon that return to the fresh waters of the creeks to spawn. The site is open from 6:00 am to 10:00 pm daily. Forest Service employees are at the site during these hours to provide information about the bears and salmon, enforce site rules, and answer questions from visitors. The rescue center opened in 2007 and now houses 8 bears. More than 20,000 visitors per year come to experience the majesty of these amazing creatures. They have sent bears to the Bronx Zoo, Montana Grizzly Encounter and the International Exotic Animal Sanctuary in Boyd, Texas. Their goal is to work with the Alaska Department of Fish & Game to someday release rehabbed bears back into the wild. As a 501(C)3 not-for-profit organization, they rely solely on admission fees and donations for funding. Please consider helping support Fortress of the Bear. There are many ways to view bears in Alaska, from just driving down the highway to hikes and treks on forest trails. However, the safest way would be to book a tour with a guided bear-viewing company. In the excitement of seeing these massive animals many tourists can forget that bears are wild, unpredictable and can be dangerous if you don’t know what you are doing. From first-hand experience I count my blessings for my Katmai guide who knew exactly what to do in every situation. These guides make the tour enjoyable, memorable and most importantly, they make it safe so you can come back to Alaska again and again.